This cowboy with a white hat looks strong. See those eyes, he'll take guff from nobody. He'll also be there to protect the less able when needed. What the advertisers don't want you to recognize is that after years of smoking, just as he is about to crush the bad guys, he'll collapse helplessly in a coughing fit as his body tries desperately to expel the toxins he has been sucking in. Try to imagine his eyes bulging and phlegm shooting from his mouth as he is bent in half, unable to stop the cough. Rest easy though, advertisers know that surrounding us with images like the one below will keep such thoughts from our minds. Unfortunately, they couldn't prevent their model from developing, then dying, of lung cancer. AUSTIN, Texas (August 27, 1999 8:03 p.m. EDT http://www.nandotimes.com) - A lawsuit filed by family members of the Marlboro Man, who died of lung cancer after years of smoking, has cleared a legal hurdle and moved one step closer to trial, attorneys said Friday. U.S. District Judge David Folsom, in a ruling in Texarkana dated Aug. 14 but disclosed publicly this week, declined to throw out a lawsuit filed by the widow and son of Marlboro pitchman David McLean. The suit names several companies, including tobacco giant Philip Morris, maker of the popular Marlboro brand. The suit, which Folsom sent to the U.S. Fifth Circuit Court of Appeals for review, claims the companies conspired to conceal the addictive nature of nicotine. If McLean's family is successful at the appeals court, a trial could begin next year, attorneys said. Michael York, a lawyer for Philip Morris, dismissed claims that smokers were unaware of the dangers of tobacco prior to government warnings and predicted the case would be dismissed before trial based on Texas law. "There have been cases against cigarette manufacturers literally nonstop every day for 45 years," said York. "People have been aware of the risks for many, many years." McLean was sometimes required to smoke up to five packs of Marlboros for a single commercial, his family claims. 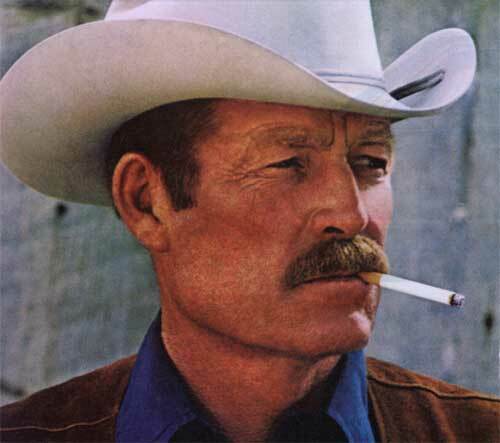 A Texas native, McLean played a rugged cowboy in Marlboro ads beginning in the 1960s. McLean developed emphysema in the 1980s and died of lung cancer in 1995 at age 73, according to widow Lilo McLean. He began smoking in the late 1930s, well before the U.S. surgeon general warned of the dangers of cigarette smoking, according to the plaintiffs' attorneys. McLean "tried to quit a number of times. He thought he was just weak, but it turns out he was really hooked," said Don Howarth, one of the attorneys representing McLean's family. "We now know they have documents that say nicotine is the vehicle that hooks them. If it hooks them, we've got a customer for life." If Folsom's ruling is ultimately upheld, it will be of particular importance to people who began smoking before the warnings came out, Howarth said. "We took the position that they knew about addiction and weren't telling the public way back then . . . and therefore it wasn't fair to preclude older people who started smoking before," Howarth said. "Judge Folsom agreed with that." Many people think that a Marlboro Man dying from lung cancer must be an Urban Legend. It definitely is not. In fact, at least 2 have succumbed.